If you are planning to import or export goods to or from the US, contact us for superior customs clearance services. We are experienced with all aspects of US import procedures, and we have the resources to provide you with all the information you need to ensure a seamless transaction. 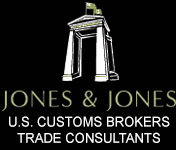 Jones & Jones U.S. Customs Brokers is an organization in Blaine, Washington. We are a family-owned company founded in 1997 that provides clearance regardless of mode of transport. At all commercial U.S. Ports of Entry. Jones & Jones Customs Brokers is a service organization. We're dedicated to providing the best possible service to our clients, U.S. Customs and Border Protection, and all Participating Government Agencies whose compliance USCBP is charged with enforcing. Ours will strive to be the most professional, knowledgeable and customer oriented service available with constant tailoring of those services to meet new demands. We recognize our customers' need to be kept informed and protected from in advertencies occurring in their transactions, representing them in THEIR best interests. U.S. Customs Brokers & Trade Consultants - Licensed by U.S. Customs and Border Protection, under the auspice of the Department of Homeland Security.